I’ve been to Hogsmeade Village before, but this weekend was my first chance to see how enchanting it looks at night. After sunset, most of Universal Studios Hollywood looks like a typical theme park with brightly-lit signs calling attention to each attraction. The Wizarding World of Harry Potter is different. When night falls, it feels even more like an old-timey British town adjacent to a massive castle, AKA The Hogwarts School of Witchcraft and Wizardry. Lit from within, the row of shops feels especially magical, and the old-fashioned street lamps add to the effect. 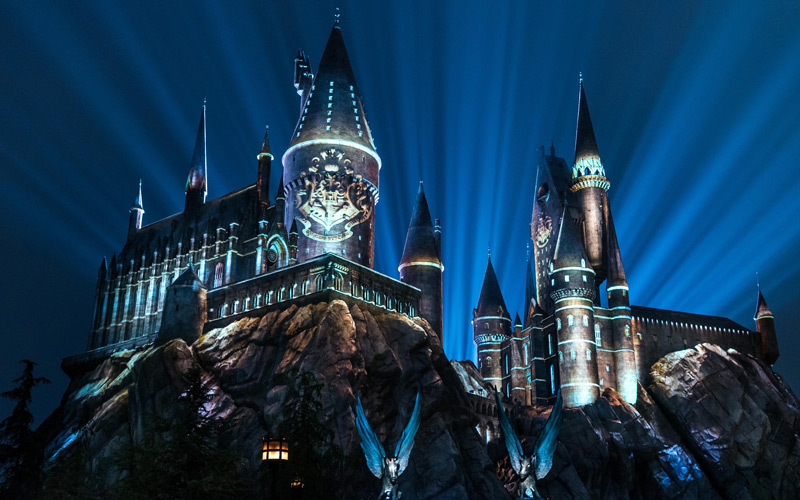 In the dimly-lit square on the far end of town I joined a crowd of wizards, witches and muggles of all ages waiting for a preview of Universal Studios’ newest feature, The Nighttime Lights at Hogwarts Castle, before its official launch on Friday, June 23. I’m not sure what type of Lumos spell was used to generate the new light show, but it must be a powerful one. Although the show only lasts about five minutes, it is gorgeous. 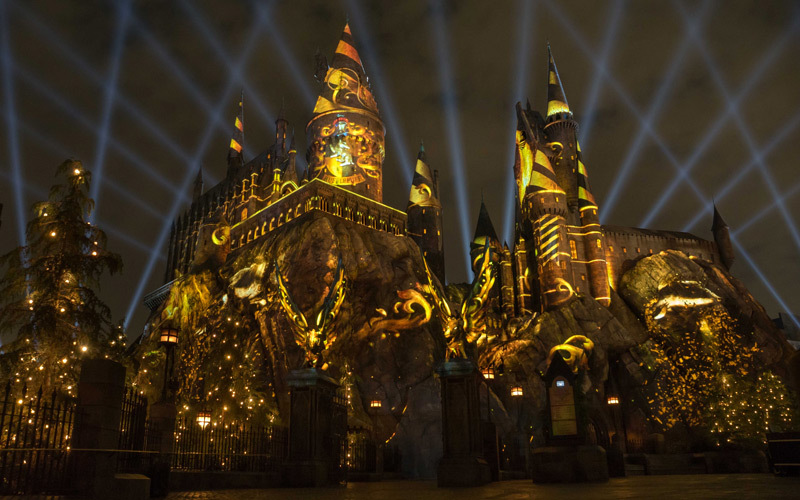 State-of-the-art projectors cover the castle’s exterior in vibrant visual effects, while audio narration by the school’s famous Sorting Hat celebrates each of Hogwarts’ four houses—Gryffindor, Ravenclaw, Hufflepuff, and Slytherin. The gathered crowd cheered for their favorites, and booed their least favorite (Slytherin, of course).The dramatic musical accompaniment was composed by John Williams, who also created the scores for the Harry Potter movies, and recorded by the London Symphony Orchestra. Starting this Friday visitors to the park will have several opportunities each night to view the new light show. A working wizard posted near Hogsmeade’s front gate told me the first show begins shortly after dark and then repeats every twenty minutes until the park closes. I asked another young wizard which part of the audience had the best viewing angle, and she recommended standing near the stage across from the castle, where the singing frogs perform during the day. I took her advice and had a fantastic view. Although the Nighttime Lights at Hogwarts Castle only last a few minutes, they are spellbinding, and definitely worth checking out—especially for die-hard Harry Potter fans. If your energy is flagging after a long day at the park, Hogsmeade makes it easy to kill a little time until the sun goes down. Get something to eat in the Three Broomsticks restaurant or order a pint of Wizard’s Brew in the Hog’s Head Pub and relax until just before showtime. If you can’t make it to Universal Studios for Friday night’s official opening of the light show, you can watch it online for free. The park will stream the show on Facebook Live, Friday, June 23, at 8:45 p.m. PST.